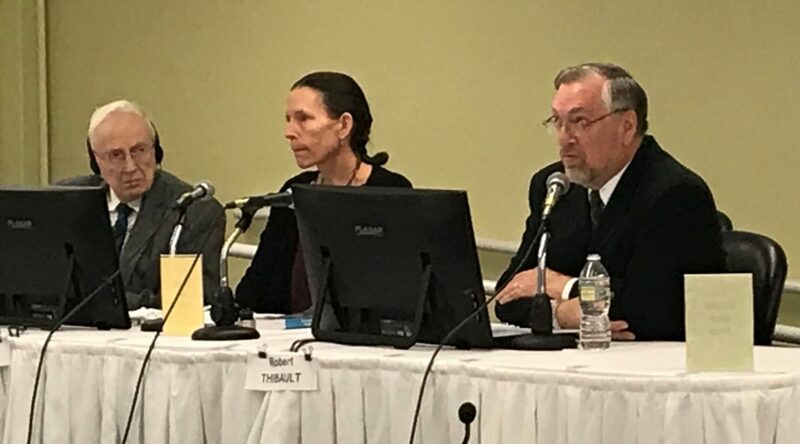 Easton town officials, left to right, long-time planning board member,Jim Collier, conservation commission chair Kris Pastoriza, and selectman Robert Thibault testified Monday at the Site Evaluation Committee's adjudicative hearing on the Northern Pass transmission line project. CONCORD — Northern Pass’s buried transmission line through Easton would more than double the town’s property value, but the town has continually voted to oppose the $1.6 billion project. At Monday’s Site Evaluation Committee’s adjudicative hearing on the 192-mile, high-voltage transmission line, attorney Barry Needleman, representing Northern Pass, said the projected assessment would be $87 million, which would be 56 percent of the town’s property value making the community the largest recipient of any town the project passes through. 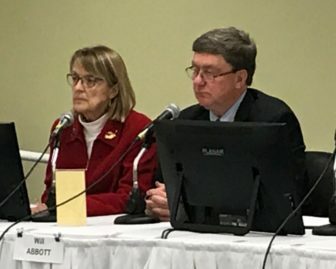 But selectman Robert Thibault said the figure is misleading because at the end of the 40-year depreciation period the assessment would be zero. Town officials detailed their meetings with Northern Pass and state officials since the project was first proposed in 2010, the first year the town approved a warrant article opposing the project to bring Hydro-Quebec electricity to the New England grid. The town has approved a similar article every year since. After seven years, town officials said they still do not know where the buried line will go along the town’s artery, Route 116. The town continues to wait for official surveys the Department of Transportation told Northern Pass it needs before acting on requests to bury the transmission line under state roadways, Thibault said. He said the right-of-way in sections along Route 116 is three-rod wide which makes a very tight fit for underground drilling and splice vaults. “We do not want the town and property owner involved in lawsuits over this,” Thibault said. That is why the selectmen wrote the Department of Transportation in October asking the agency to set the right-of-ways along Route 116, he said, noting they have yet to receive a reply. The narrow road and state right-of-way would mean the road would have to be closed during some construction periods, Thibault said, and that would impact emergency services because there are no easy detours for much of the town. He noted if some sections of Route 116 are closed, the detour could be more than 20 miles and the town depends on help from surrounding communities for police and fire fighters with only a volunteer fire department. Longtime planning board member Jim Collier said Route 116 was originally a footpath from Haverhill to Franconia and then over time became a road for autos. Collier touted one of the finest “glacial drift aquifers” in the state the town protects through a zoning overlay district. The transmission line would go through the aquifer and would not be allowed under town zoning, he noted. The Site Evaluation Committee decision and its conditions would preempts local zoning and land use ordinances. Thibault also said the project would lower property values along the buried transmission line. The properties account for one-third of all properties in town, he noted. Some of those property owners have told him they would seek tax abatements, he said, and that will increase taxes for the non-abutting property owners. Needleman questioned if the town had done any analysis or research of other places with transmission lines to judge whether property values would be diminished because the company’s expert believes property values along the buried sections will not be impacted. Thibault said it was common sense the property value would diminish with a high-voltage transmission line buried in the front yards. Needleman questioned Conservation Commission chair Kris Pastoriza about earlier statements she made that the line should be buried when an overhead the line was proposed. But Pastoriza said that was when she and others believed burying the line would entail a four-inch conduit and not what is bring proposed with two encased lines and splice vaults. Society vice president Will Abbott said the project’s most damaging impact would be on The Rocks Estate the society owns in Bethlehem. The estate is used to raise Christmas trees — the society sells about 50,000 a year — and is the society’s northern visitation and education center. Visitors come from all over the world and the United States, Difley said, and local bed and breakfasts promote the experience. “This is not grabbing a tree off a rack,” she said. Abbott said the transmission line would impact 13 conservation easements the society holds and said several prohibit commercial use, which is what Northern Pass would be. He said the society expects to legally challenge the project’s use of the sites. Abbott said there are different requirements in other easements that also would not allow their use for a transmission line. But Needleman noted one of the society’s land acquisitions intended to block the project near the Balsams resort, meant the transmission line had to be moved and that makes it more visible from Little Diamond Pond and Coleman State Park. But Abbott said all the impacts could be avoided if there were no overhead towers. The society wants the transmission lines buried in the new 30-mile section from the Canadian border to Dummer and along I-93. The final adjudicative hearings on Northern Pass are scheduled to end before Christmas. Deliberative sessions are scheduled for January and February. The committee has until the end of February to make a decision on the project first proposed in 2010. The next hearing will be Tuesday with Deefield abutters to the project.